Beautifully engraved certificate from eDiets.com issued in 2003. This historic document was printed by the Columbia Financial Printing Company and has an ornate border around it. This item has the printed signatures of the Company's Chief Executive Officer and Secretary (Christine M. Brown). 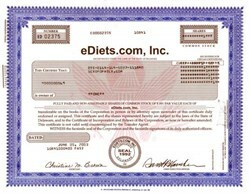 eDiets.com, Inc. is the largest subscription-based online diet, fitness and counseling network. Founded in 1996 and with corporate headquarters in Deerfield Beach, Florida, eDiets.com offers online subscription-based weight-loss programs using proprietary software to generate customized diet programs. The programs are designed based upon individual members' personal goals, food preferences and lifestyles. Over 1.2 million consumers have purchased memberships since 1997 and over 13 million opt-in subscribers currently receive the company�s leading proprietary bi-weekly health and wellness newsletter, eDiets Diet & Fitness News.